Study Medical Photos: Effect Of Hyperuricaemia On Kidney. The above picture shows uric acid kidney stone kept in the pathology lab. Let us briefly study the effects of Hyperuricaemia on kidney. Increased cell turn over: Lymphoma, leukemia, psoariasisf, hemolysis, muscle death-rhabdomyolysis. Hyperuricaemia and Renal Failure: Severe renal failure from any cause may be associated with hyperuricaemia, and rarely this may cause gout. Sometimes the relationship of cause and effect is reversed so that it is hyperuricaemia that causes the renal failure. This can occur in cytotoxic treatment (tumor lysis syndrome) and in muscle necrosis. How Urate Causes Renal Failure? Urate is poorly soluble in water so over excretion can lead to crystal precipitation. Renal failure occurs most commonly becauseurate precipitates in the renal tubules. This may occur at a plasma level > 1.19mmol/L. In some instances uretric obstruction from urate crystals may occur. This responds to retrograde uretric catheterization and lavage. Prevention Of Renal Failure: Before starting chemotherapy , ensure good hydration and initiate allopurinol (xanthine oxidase inhibitor) which prevents sharp rise in urate following chemotherapy. Then give prompt hydration +/- loop diuretic to wash uric acid crystals out of renal tubules. Urate Renal Stones: Urate stones comprise 5-10% of all renal stones and are translucent. Distal small bowel disease or resection. 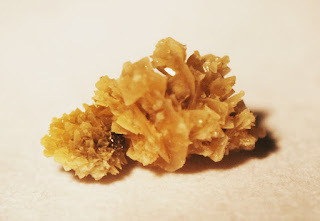 Unlike most other renal calculi uric acid stones , can often be dissolved with either systemic or topical alkalinizing agents: Potassium citrate or Potassium bicarbonate at a dose titrated to alkalinize the urine to a pH of 6-7 dissolves some urate stones. If hyperuricosuria consider dietary management along with allopurinol/.